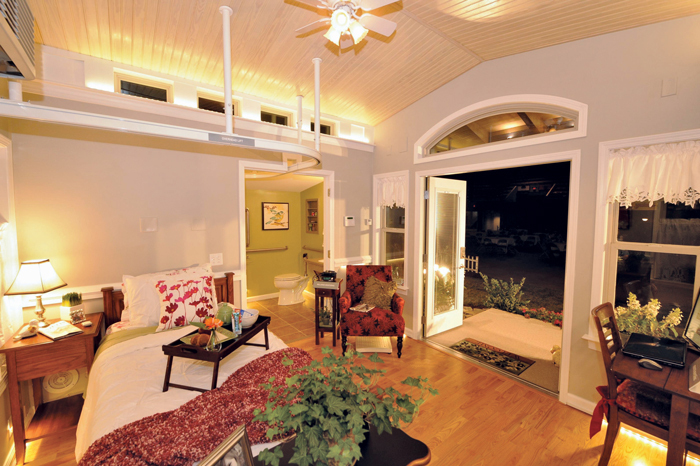 High-tech Med-cottage or “Granny Pods”: Assisted Living of the Future? What if you could bring a fully equipped, high-tech assisted living space to your home for an aging parent? Would you consider a modular, temporary guest house that could be removed after a few months? i ran across this Washington Post article “Pioneering the Granny Pod: Fairfax County family adapts to high-tech dwelling that could change elder care“ and it got me thinking about the many ways this could be used by my clients. A Methodist minister in Virginia had the idea that “as America grows older, its aging adults could avoid a jarring move to the nursing home by living in small, specially equipped, temporary shelters close to relatives” and he set out to create the Medcottage, a portable high-tech cottage that could be moved to the family’s property as a home for a relative in need of special care. People have strong opinions about modular housing but the modern designs and practicality of these options has to make you stop and think twice. Rather than making permanent and expensive renovations to your home, would you consider a “granny pod” as an option to give aging parents security, comfort, and privacy? Or for older parents who split their time between different cities as a temporary apartment? What about a modular solution for my clients who need a guest room on the main floor of their home with its own sitting area, perhaps brought in for the holidays and rented by the month? And with the U.S’s aging population, I believe it will get to the point where there is a resale market for this type of space. With threshold-free floors, accessible showers, and medical monitoring and equipment already factored into the design of many of these units, it takes a lot of the guesswork out of working with a contractor who may not be as experienced with renovations like these. Of course, there are questions of zoning, space, and family dynamics to consider, but it’s certainly food for thought. I’d love to hear your opinions! If zoning can address the additional structure, I think there will be a market for this! This entry was posted on November 2, 2015, 2:05 pm and is filed under Uncategorized. You can follow any responses to this entry through RSS 2.0. You can leave a response, or trackback from your own site.